3777 ESS NIUE (1979) Virgin & child by P. Serra. Set of 7 progressive proofs. Scott No 258, Yvert No 249. 5291 ESS NIUE (1979) Apollo XI Launch*. Set of 7 progressive proofs. Scott No 255, Yvert No 246. Apollo XI Moon landing 10th anniversary. 5292 ESS NIUE (1979) Lunar module*. Set of 7 progressive proofs. Scott No 256, Yvert No 247. Apollo XI Moon landing 10th anniversary. 5293 ESS NIUE (1979) Splashdown and recovery*. Set of 7 progressive proofs. Scott No 257, Yvert No 248. Apollo XI Moon landing 10th anniversary. 16538 ESS NIUE (1983a) Right whale*. Set of 6 trial color imperforate margin proofs, showing different colors as they were added to make the final stamp. Save the Whales Campaign. Scott No 380, Yvert No 388. Scarce! 16539 ESS NIUE (1983c) Sei whale*. 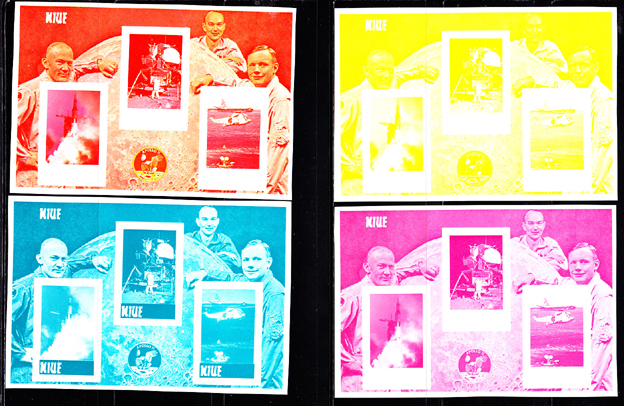 Set of 6 trial color imperforate margin proofs, showing different colors as they were added to make the final stamp. Save the Whales Campaign. Scott No 382, Yvert No 390. Scarce!